Home » art , awesome duuuuuuude , books , comedy , humor , josh cooley , movies » Pixar artist puts mean (but fun) spin on Lil' Golden Books! 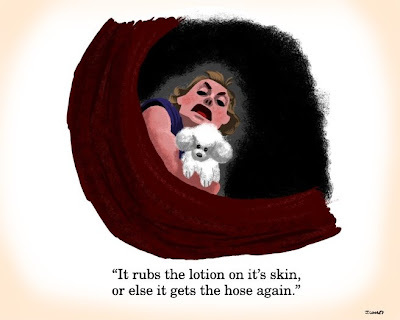 Pixar artist puts mean (but fun) spin on Lil' Golden Books! Pixar animation artist Josh Cooley has been making a series of illustrations inspired by - in addition to parodying - those classic Lil' Golden Books that so many of us grew up with. And now this summer Cooley is coming out with an actual honest-to-goodness book of his work! Lil' Inappropriate Golden Book: MOVIES 'R' FUN! takes scenes from well-known R-rated movies and, ummm... "kiddifies" them. Ever seen serial killer Buffalo Bill in a children's book? You have now! GeekTyrant has several more of Cooley's hilarious renditions, including "children's" versions of The Godfather, Se7en and The Big Lebowski.